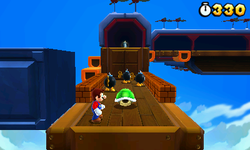 Special 2- Airship is the Airship course of Special 2 in Super Mario 3D Land. It is based of World 3-Airship. The player starts out on a wooden platform with two ? Blocks next to them, the one on the left contains multiple Coins, whilst the one on the right contains a Poison Mushroom. The player will continue up the wooden platform avoiding Spikes and Bob-ombs. The player will then jump onto the next wooden platform which has a launcher that fires Banzai Bills. The player will then jump onto another wooden platform that has a Spiked Ball launcher and a Red Ring that will spawn five Red Coins, if the player collects them all in time they will receive either a power-up or a 1-Up Mushroom. The player will continue up some more wooden platforms whilst avoiding Spiked Balls, they will then reach a large platform that contains the Checkpoint Flag. The player will then jump down onto another platform where there are several Bob-ombs and a Koopa Shell, the player can use the Koopa Shell and get a 1-Up. The player will then cross a long wooden platform that has various Donut Lifts, Spike Platforms and Banzai Bills. After this, the player will reach an Airship that has a Warp Box that warps the player to the final area. On the bow of the Airship in the final area there is a fake 1-Up Mushroom sign, if it is destroyed it will yield a 1-Up Mushroom. The player will then have to jump up three stairs that have some Spikes on them before reaching the Goal Pole. Star Medal 1: Floating above a Spiked Ball launcher just before the Checkpoint Flag. Star Medal 2: Located on a platform in front of a Banzai Bill launcher, a Banzai Bill get ready to fire when the player jumps onto the platform. Star Medal 3: Located on a Spike Platform near the Banzai Bills and Donut Lifts. This page was last edited on April 5, 2019, at 18:21.